The holiday season just passed, and with it, craft season. That’s right, I decided to go with crafts, homemade Christmas gifts this year. As a single income family, and lots and lots of people we want to give gifts and love to, we simply couldn’t buy presents for everyone. So we decided to make them. A couple months ago, my grandmother decided to officially finalize her retirement from baking. She cleaned out her baking supplies and gave a lot of the old pans and other goodies to my mom and me. One of the things she gave us is her boards. Boards that she put the cakes on. They’re not quite cardboard not quite wood, but something in between. And in all shapes and sizes. Okay, they’re mostly round, but there were a few other shapes and they did come in varying sizes. I decided to use these to make something for our family and friends we wanted to give gifts too. If you look on Pinterest these days, you will find a plethora of plaques for walls with cute quotes and sayings on them. And many of them appear to be chalkboard. So that’s what I decided to do. 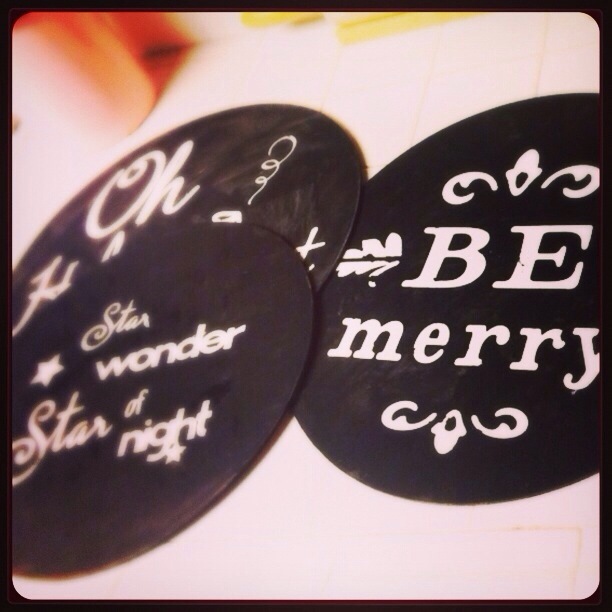 I made chalkboard look-alike plaques with Christmas quotes and sayings. I started out by painting all the boards that I was planning to use white. I had to do a couple coats on some of them because some of the boards were a little beat up. Then, the real fun started. I use my cricket to cut out words and other cute shapes. I cut them out of freezer paper, then ironed them on to the boards waxy side down. I then put a light coat of black paint over the whole board. While the paint was still a little bit tacky, mostly dry but not 100%, I gently peeled off the freezer paper. Since the freezer paper had been ironed on to wood, it didn’t peel off totally 100% cleanly. But, that gave a look of distress that I was actually going for. I then used a fine sandpaper to smooth out the wood and even distress some of the black paint. Following that, I gave it a coat of mod podge to seal in the design. Once they were completely dry, I asked my husband to drill a hole in the top (not that I couldn’t do it myself, I just wanted to help😉). I slipped in a ribbon to tie it off and voilà, super cute little signs to be hung on people’s doors in place of wreaths or on walls of peoples hallways.